BUSHENYI – Authorities at Ishaka Adventist School of nursing and midwifery in Ishaka-Bushenyi Municipality have suspended two senior staffs following videos that went viral where Tutors were seen beating students in the school compound. Early this week, social media was awash of various videos where students are seen being beaten in front of others. We have been told that prior to this, the school’s deputy principle Joab Rutakoba had suspended two students for allegedly escaping from school. That on return after their suspension, Rutakoba ordered their parents to clobber them not to again act contrary to the school rules and regulation. The suspended are the deputy principal Joab Rutakoba and clinical instructor who participated in the canning. Management has instituted a committee to carry out investigations. In a statement dated Feb 6, 2019, issued by Lydia Komugisha the senior administrator to the permanent secretary Ministry of education and sports regretted and apologized for the unfortunate incidents concerning punishing students. The hospital and its health training institution would like to categorically disassociate ourselves from the conduct of our staffs. We deeply regret the embarrassment the pictures trending on social media o God, public, parents, students and dignity of humanity. We would like to state that our school doesn’t condone corporal punishment and neither is it institutionalized. we have rules and regulations of which canning is not part. It unfortunate that these rules and regulations were not followed by the staffs.”The statement reads in part. It adds, “Management has already held meetings to investigate these issues to check whether such cases have been happening and what led to these actions. 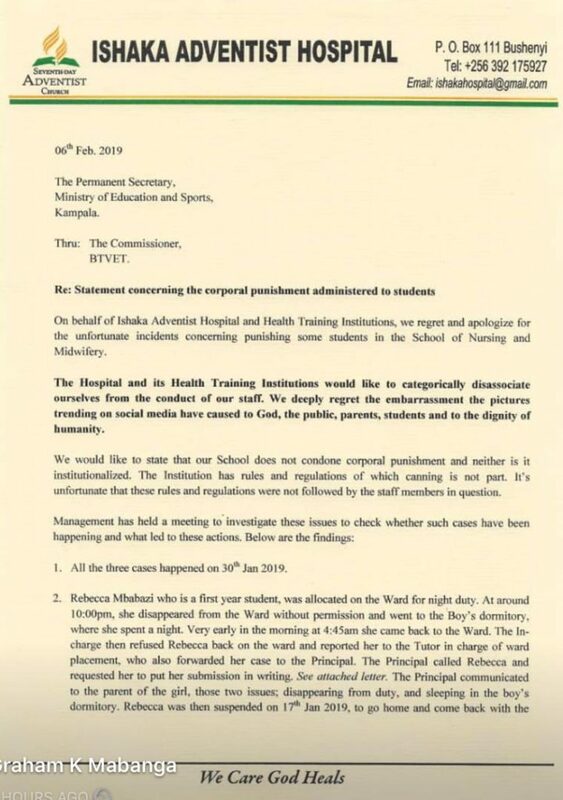 The statement further shows that one Rebecca Mbabazi a first-year student who was also seen in the video being canned, was allocated t ward for night duty but at around 4 pm she disappeared from the ward without permission and went to boy’s dormitory for a night. Very early in the morning, she came back to the ward at around 4: 45 am the in charge refused her on the ward and reported her to the Tutor in charge of ward placement who also forwarded her case to the principle. That the principle informed Rebecca’s parents about the two cases of disappearing from the ward and sleeping in the boy’s dormitory, later she was suspended n 17th January 2019 and come back with parents on Monday 4th February before she was subjected to corporal punishment. That another student had spent one week not at school and when the deputy principle contacted her parents, they confirmed that he was not home. When he returned parents were called and the student pleaded to canned instead of being suspended according to the statement. Further actions taken were that they have identified psychologists to counsel and guide the affected students. “And these will meet parents of the affected students. We have met with all staffs to emphasize reading, understanding and applying school rules and regulations,” the statement reads.